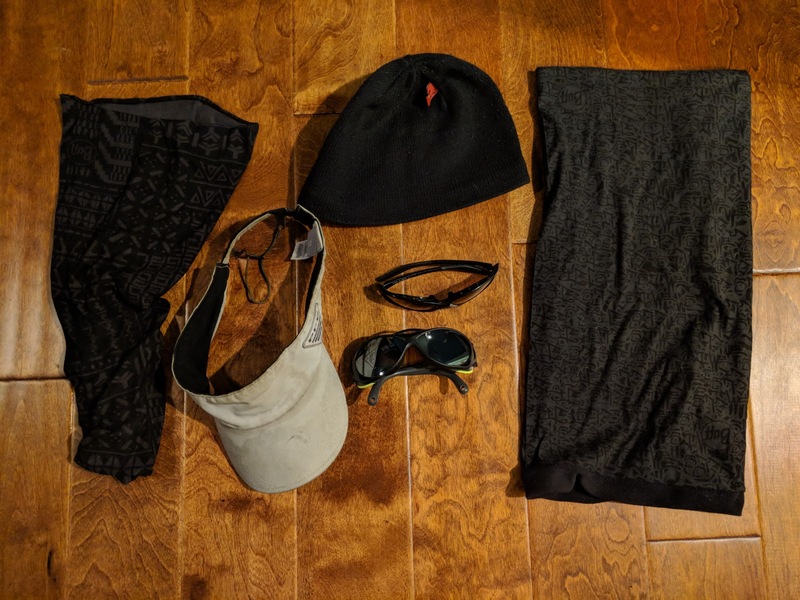 Climbing, swimming, and sailing on purpose: 9 Days to my KTM Departure: My gear for me head, hands, and body. 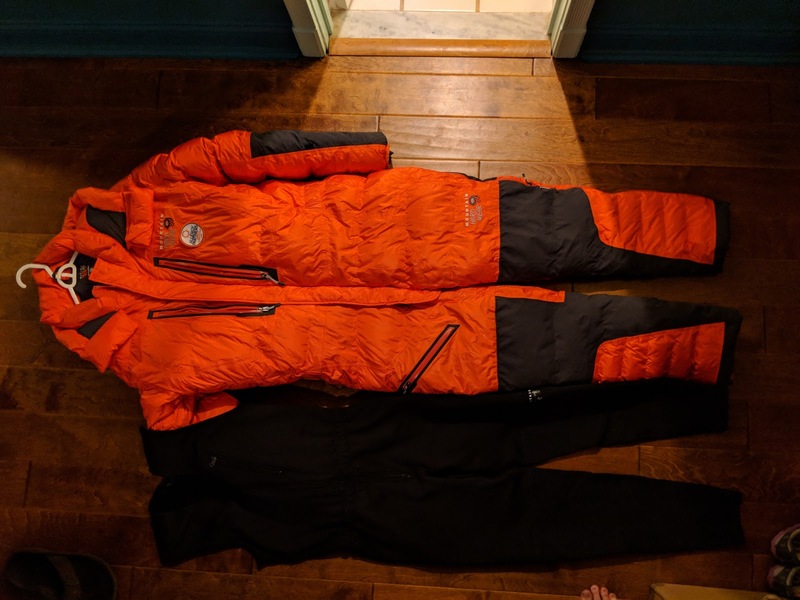 9 Days to my KTM Departure: My gear for me head, hands, and body. From the bottom right going clockwise, I displayed my hand gear according to weight. My trusted Mountain Hardwear light-duty gloves (bottom right) are my most versatile piece of gear. I cannot recall the model but they are no longer manufactured. After I wore my first pair, I went to the store and purchased 3 more pairs. Each pair lasts me about 3 seasons and I am on my last pair - tells you how long I have been using them. These gloves are light enough to keep my hands warm until about 20F (-7C) provided I am moving. I love these gloves, wear them for all winter climbs, and rely upon them to keep my hands from getting sopping wet with sweat. My guess is that I will wear these gloves from Chinese Basecamp (CBC) until probably Camp 1 - weather permitting. Next, I have my Helstra Heli Ski Gloves. These beasts are great for colder weather (for me at least). They keep my hands toasty warm from about 20F (-7C) to about 0F (-18C) and allow me to use my fingers. I can climb and ski with these in the most challenging conditions without much fear of my hands getting cold. When the air temperature warms up though, my hands tend to sweat a ton in these gloves. Thus, I probably will alternate early on between these gloves and my lighter Mountain Hardwear gloves. My Helstra gloves would be my cold weather hand gear - probably used between Advanced Base Camp (ABC) until at least the North Col (Camp 1) or even Camp 2. I prefer to have my fingers available while I climb so gloves are a priority for as long as possible. Once I get up higher than Camp 2, I intend to switch to my mitts. The first mitt (top row to the left) is my lightest mitts - the Norrona trollveggen dri PrimaLoft 400 long mittens. I love these mittens because they keep my hands dry and warm but do so without sacrificing too much in my hand dexterity. Typically, I wear these mitts when I finally get going on a long, high climb. I can easily maneuver my jumar and access all my gear without taking my mitts off when I wear these. My best guess - although I don't keep track of this detail - is that I would wear these mitts after I get a full head of steam past Camp 3. 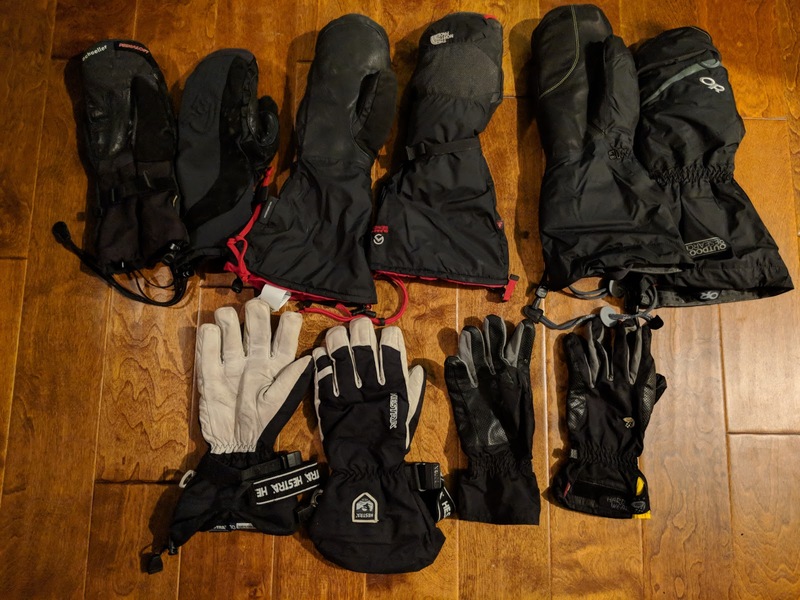 Before I put these on, I probably will wear my warm mitts - either my North Face Himalayan Mitt (center top row) or my beastly Outdoor Research Alti Mitt. The North Face mittens are decent for colder climes where I do not need much hand dexterity. I tend to favor slightly smaller mittens for the Himalayan mitts - I wear a medium in these whereas all my other hand gear is a large. The cold killer is definitely my OR Altis. These mittens keep my hands warm for all temperatures at or below -20F (-28C). I feel absolutely nothing but warm, coziness inside these mittens but they offer me almost no dexterity with my fingers; even my thumb feels somewhat restricted in these mittens. As you can see, I have a hand protection progression with some redundancy. If a pair of my lighter gloves get wet, I must move to mittens while my gloves dry. Drying gear on the mountain can be a challenge but we have ways to hang our gear inside the tent while we sleep. With the heat coming from our bodies, we can dry most anything. Still, wet hand gear is a huge drag. I intend to dry all my gear almost daily - especially my hand gear. A popular saying is "Cold hands, cold feet? Put a hat on." I abide by this saying without hesitation. Alan Arnette asked me what piece of equipment is my favorite and I knew exactly what to say: my watch cap (center top in picture below). I wear this cap almost every minute I am on the mountain - even when sleeping. When it is warm, I wear my trusty visor (with wind leash to keep it attached to me at all times). Unless it is dark outside, I wear my Nativ glasses (with interchangeable lenses) as eye protection or if the weather really turns sour, I wear my Julbo Explorer Mountain Sunglasses. These glasses are great when the weather is uncooperative. I find that these glasses tend to fog in the heat so I only use them in windy, inclement weather. Yes, I do wear goggles too - Oakleys (not pictured) - but I find they fog up when I climb and I end up spending more time trying to clear them rather than focusing on the climb. The final pieces of my head gear are my buffs. On the left (picture above) is my daily light buff that serves two purposes: 1) keeps the sun off my face and offers some warmth and 2) keeps the dust from getting into my lungs during the approach. I intend to use this buff almost daily to keep my skin from getting too much sun and my lungs clear from the dust. The right most buff is my heavy duty one that replaced my balaclava. In years past, I would wear a mask during climbs that kept my face warm, however, the balaclava mask was unwieldy and often caused my glasses/goggles to constantly fog. I now use my thicker buff and find it almost never fogs my eye protection. Plus, the buff extends down to my chest to keep the cold from entering through my neck area in my summit suit or parka. I have two pieces that cover my entire body. The first piece is a mid-layer (bottom in picture below) that goes between my base layer and my summit suit (top in picture below). These two pieces are critical for my success. The summit suit is basically a down sleeping bag with legs and arms. When I put it on at home, I start sweating immediately and don't stop sweating until about an hour after I take it off. Seriously, this suit is HOT! The suit fits very well, has tons of pockets, and will keep me toasty warm from Camp 3 and higher. I even plan on sleeping in the suit when I reach the highest camp. No need for a sleeping bag when I wear it. What really seals the warm deal here is the mid-layer, farmer john suit that clings to my body like a second skin. That layer offers me just a little bit of added warmth and stops and "leaks" of air from hitting my skin and causing a chill. Keeping warm when high up on a mountain requires this type of equipment. It is not the cold that really affects us but rather the altitude. When we are struggling to acclimatize to the low oxygen environment, our bodies shunt blood from our periphery to our core - hence, we tend to get frostbite in our hands and toes. The purpose of the equipment is to keep our hands and toes warm in spite of the poor, peripheral blood circulation. Additionally, a slow, gradual exposure to high altitude (and low oxygen) alleviates the blood restriction in our periphery. So preparation from both the gear and the acclimatization process protects us from frostbite. There you have it! My gear list is now complete. Time to start packing. I will show you how all this gear goes into my two expedition bags. Pictures of packing come shortly. In the meantime, I have two other posts to share. My next post shows you the before and after of my training. I began training for this climb in mid-July after I returned from Cork Distance Week (a wonderful open-water swimming event held in Kinsale, Ireland). At the time, I weighed 198 lbs (90 kg) and now I weigh 176 lbs (80 kg). Yep, I lost a ton of weight. Moreover, I also gained a fair bit of muscle mass in my legs. Come see for yourself in my next post. After that post, I intend to test my Garmin InReach device by posting several tests on my blog. Feel free to check out the maps and such; don't hesitate to ask me questions. I intend to update everyone so that you can follow Brendan and me during our climb.